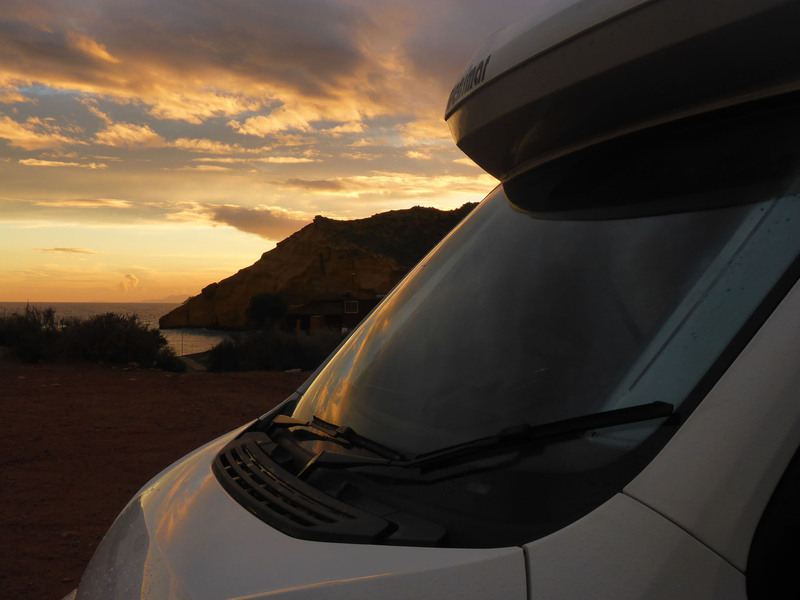 We had a leisurely stay in a nice commercial aire in Almerimar, with a short walk along the local beach our only activity for the day. The following morning we moved another short distance along the coast to spend a night on a clifftop perch overlooking the sea. 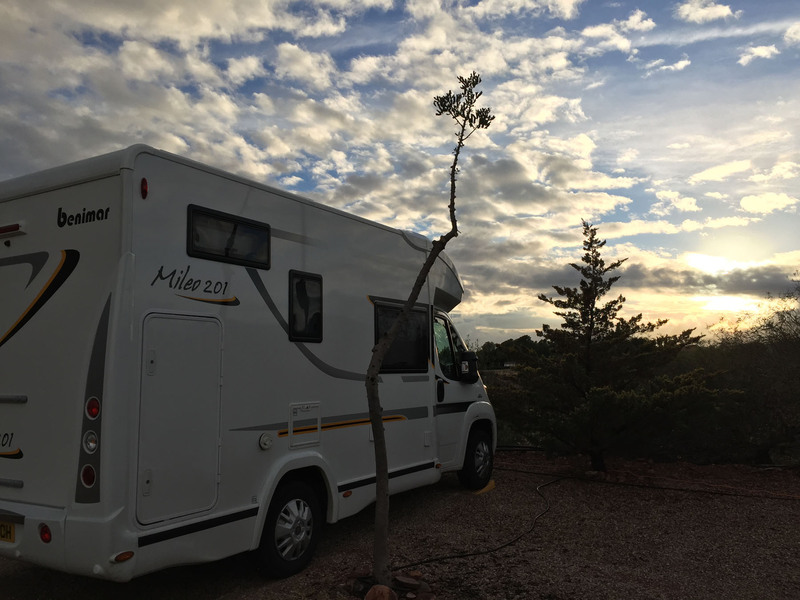 This was at Playa la Carolina, a popular off-road parking spot that had perhaps thirty motorhomes parked up in little groups all along the sea front, fitting wherever possible between dunes and clumps of ragged vegetation. We had a bracing walk along the coastal hills, enjoying the views back across the sea and out to rugged islands. 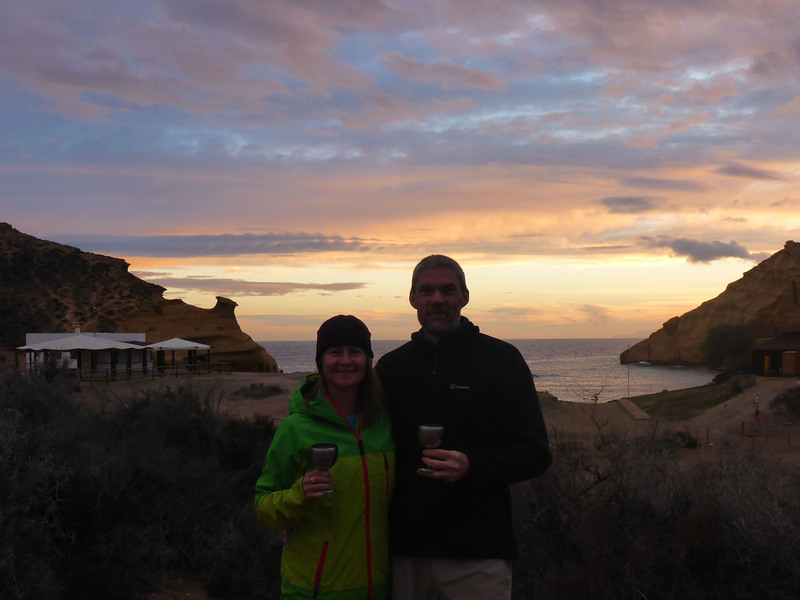 Later we watched a wonderful sunset, enjoyed with glasses of German mulled wine, glühwein, in hand. 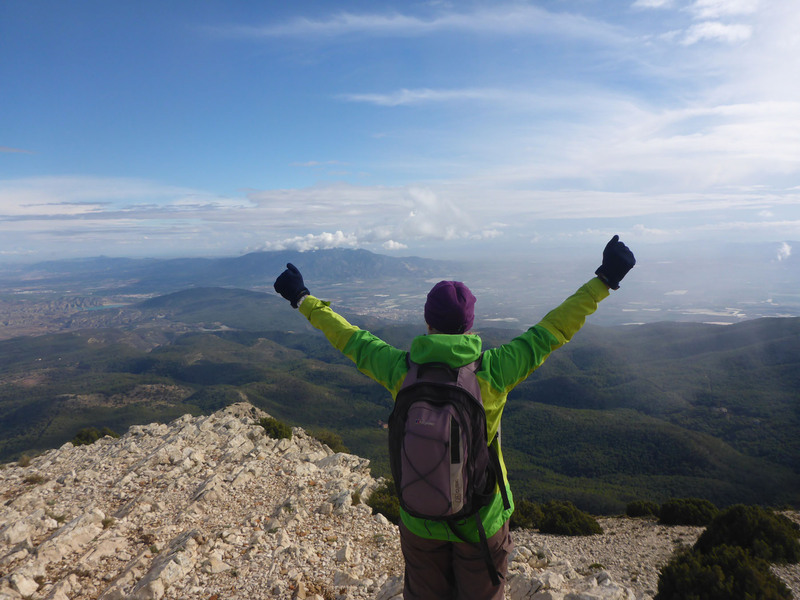 The following day we arrived in the grim, concrete outskirts of Totana, our chosen spot for exploring the Sierra Espuña, and quickly located our aire. It was a very pleasant spot, even in the persistent rain that insisted on following us. After several false starts and exchanges of opinion, we chose a corner spot in the camp that suited us best and settled in. 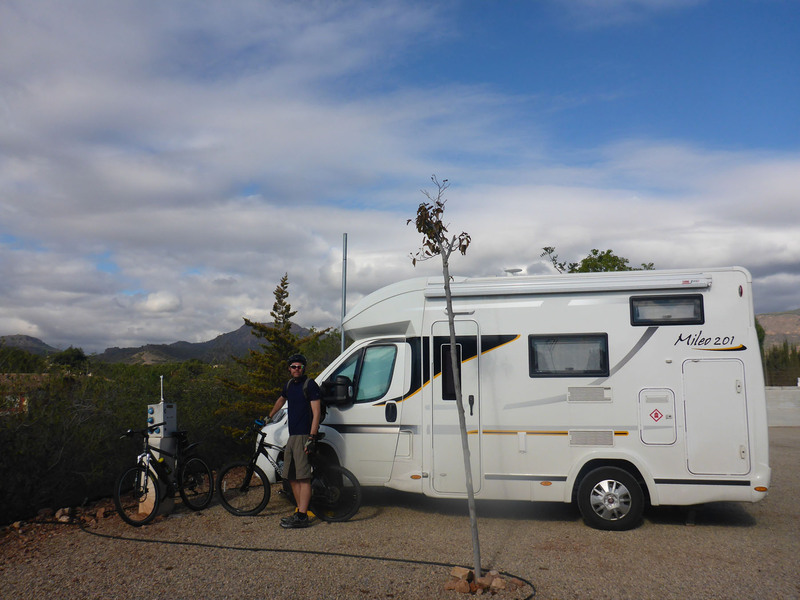 As we serviced Benny we chatted to our Norwegian neighbour about his travels and home country. 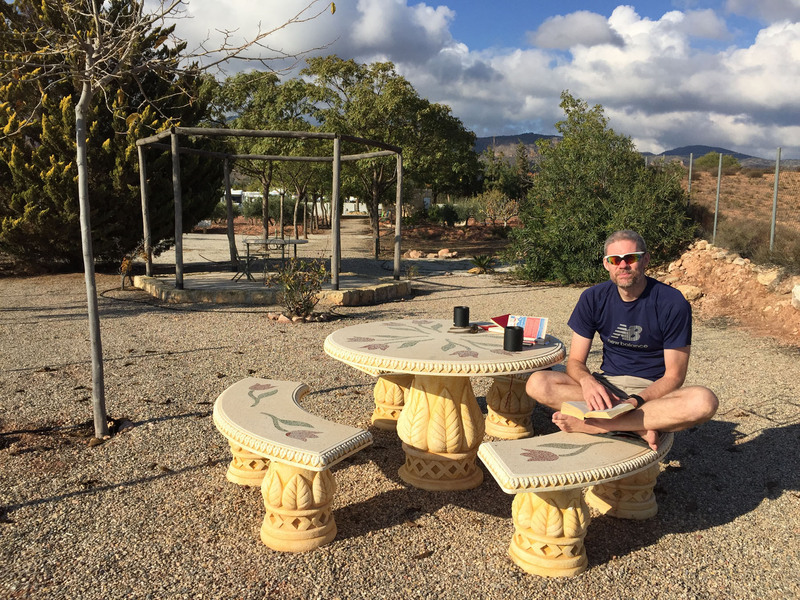 We had a quick look around the site and were impressed by the setup, with a free book exchange and honesty boxes for staying fees and electric costs. There were maps for walks available for use, and a local baker visited the site each morning at 9am with fresh treats for the visiting motorhomers. Not a bad place to pass a few days. We later walked into the local town, to see what was around. It was about a 4km walk to the main square. 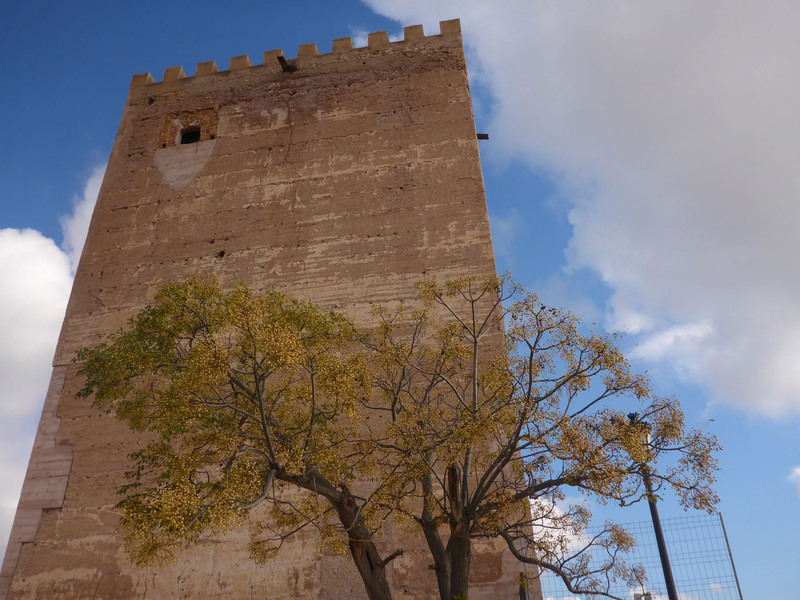 We didn’t manage to see the town at its best, as usual we chose siesta time to visit and it as mostly closed. The driving rain and our fully sodden clothes didn’t help to lift this mini-adventure to epic levels. A few damp stalls, looking forlorn and bored, littered the central square as they wished for less rain and more visitors to buy their wares. It looked like it may be a hiatus in a local music festival that had been otherwise cancelled or paused due to the spoiling weather. We dripped back home solemnly and spent the rest of the afternoon and evening inside, planning out routes for use on what was sure to be a better weather day the following morning. We awoke to a surprisingly good sky with little cloud, and the beginnings of some sun – game on. 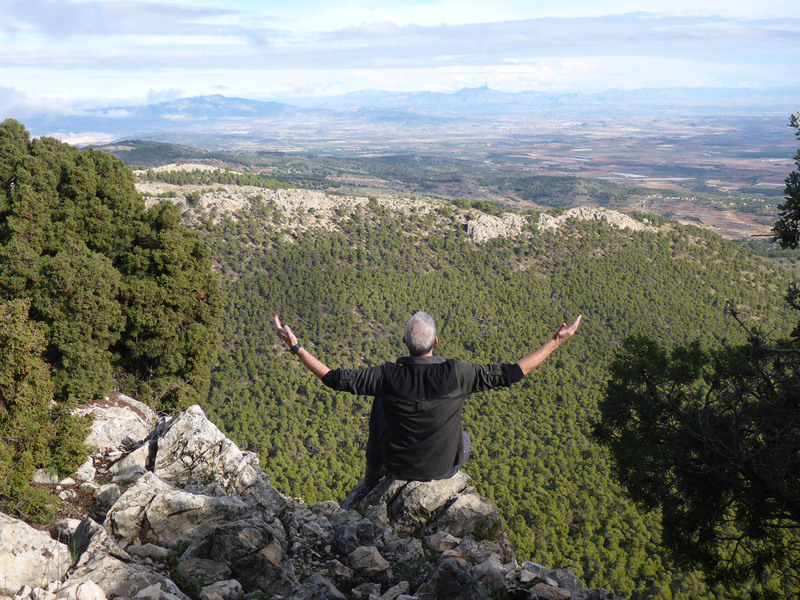 We drove into nearby Sierra Espuña mountains, to enjoy a long walk. 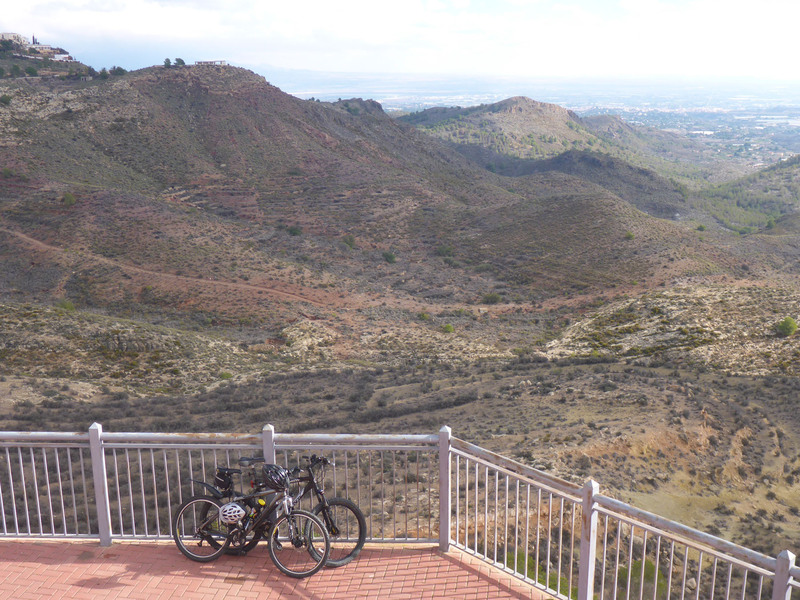 After passing through Alhama de Murcia and El Berro, we undertook a relatively long drive into the mountains, up many narrow curving roads and very hairy hairpins. The road was clear of any traffic, which made this potentially challenging route a veritable pleasure to drive. 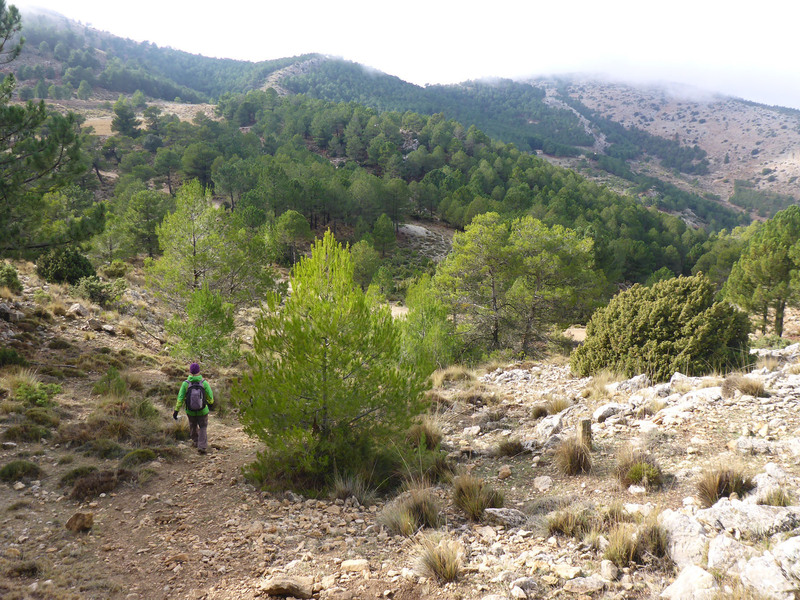 We began our walk from the area recreativa at La Perdiz. Benny was securely nestled under a sprinkling of pines to keep him company and in shade whilst we were away walking. Straight away we had a long, steep climb up through the tree line, up a scree slope on a knife edge ridge. Soon the path passed over an area that had been terraced to create a narrow but less steep path that snaked up the mountain. It was a hot, sweaty ascent that certainly woke up our legs, but rewarded us immediately with wonderful views over the forests and distant peaks. 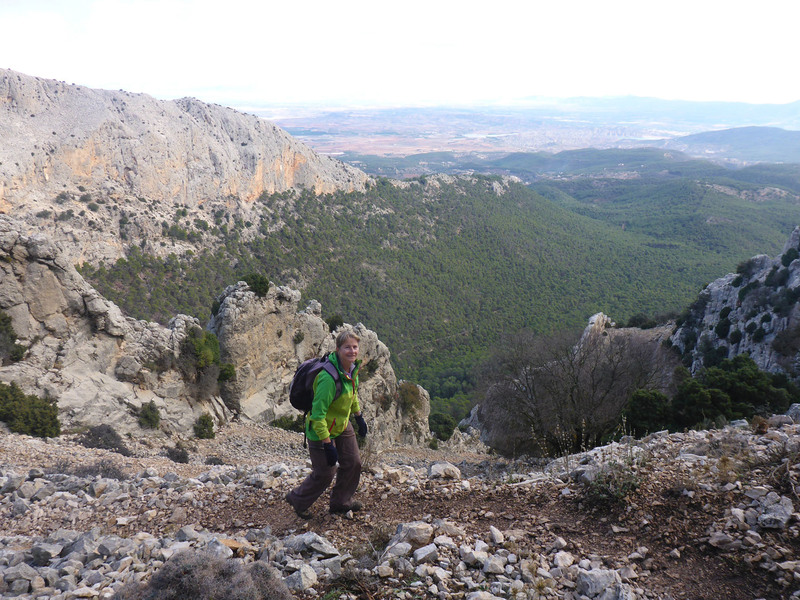 Around two thirds of the way up the face, we cut right, passed through a spur in the rock and into deep shadow. The path dropped a little (we hate losing height already gained) as it mostly followed the contours of the mountain around the side of the mountain, to reach more impressively built zigzagging hairpin paths. We followed these up to a viewpoint at the saddle of the hill, before turning left and continuing upwards to our first summit. After such a promising start, the weather was now closing in, with intermittent low cloud hiding our path from us. It cleared again soon after, but was definitely going to be a lottery as to whether we arrived at the summit with any view or not. We saw some passing Barbary sheep wander across the mountain, taking little notice of us. 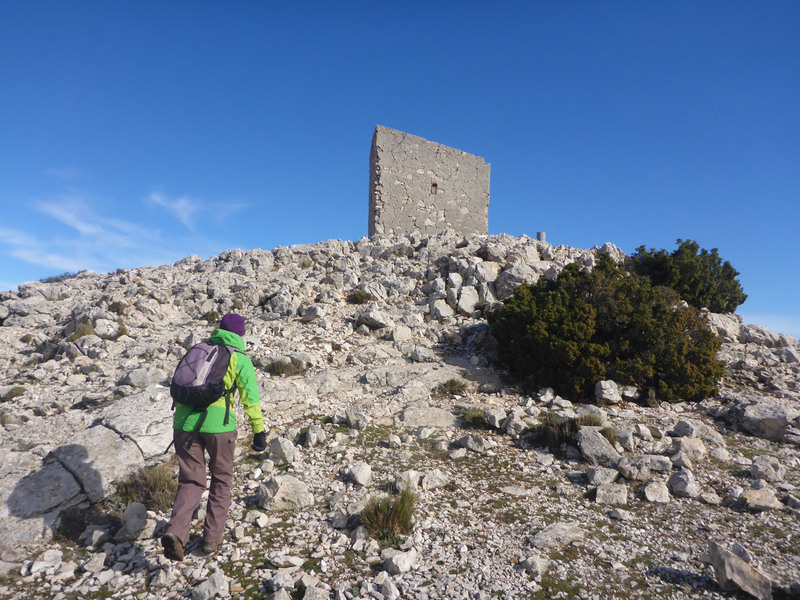 A few short vertical climbs slowed our progress a little, but we soon reached the abandoned hut on the top, built with concrete walls but unfortunately with no roof remaining. 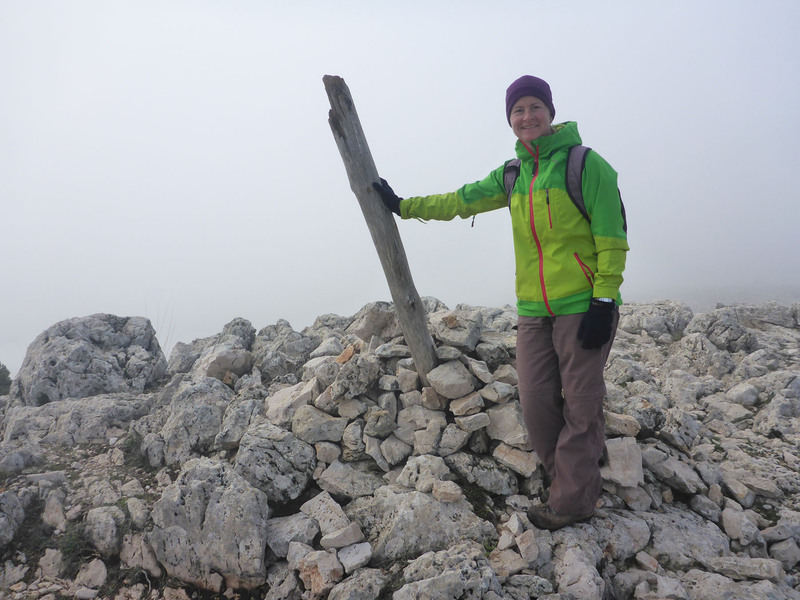 This was Morron Chico, at 1444m nearly 100m higher than Ben Nevis, and we timed it beautifully with a break in the clouds to enjoy expansive views. Returning down the same way to a fork in the path, we turned left again and proceeded in the direction of the next summit point, Morra De Las Moscas, at 1502m high. With deep cloud returning to remove our visibility, we were glad the path was marked with small cairns to aid our navigation. 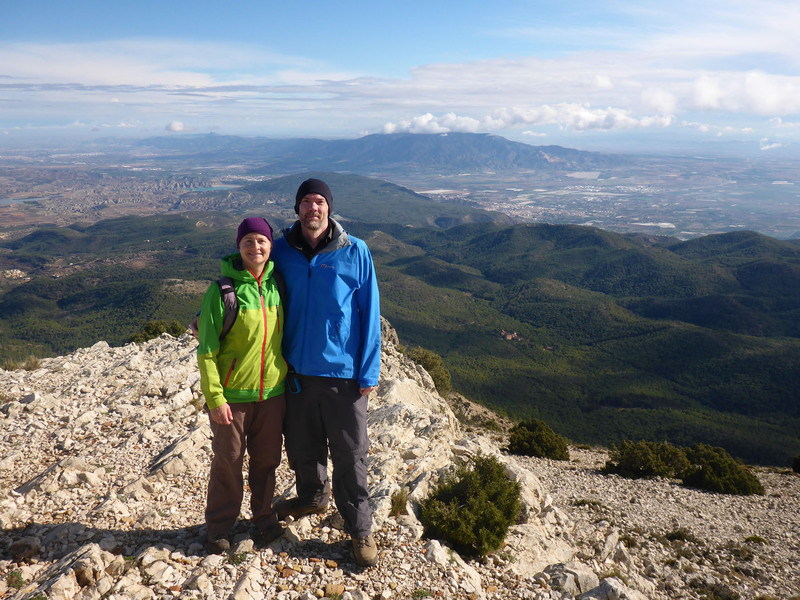 After a slow, deliberate climb to be safe, we reached the highest point. Only a thick white stick held vertical by a tightly built cairn marked this summit, and we were very glad to have been rewarded with views from the lower point. We descended out of the cloud and back into the tree lined valley. 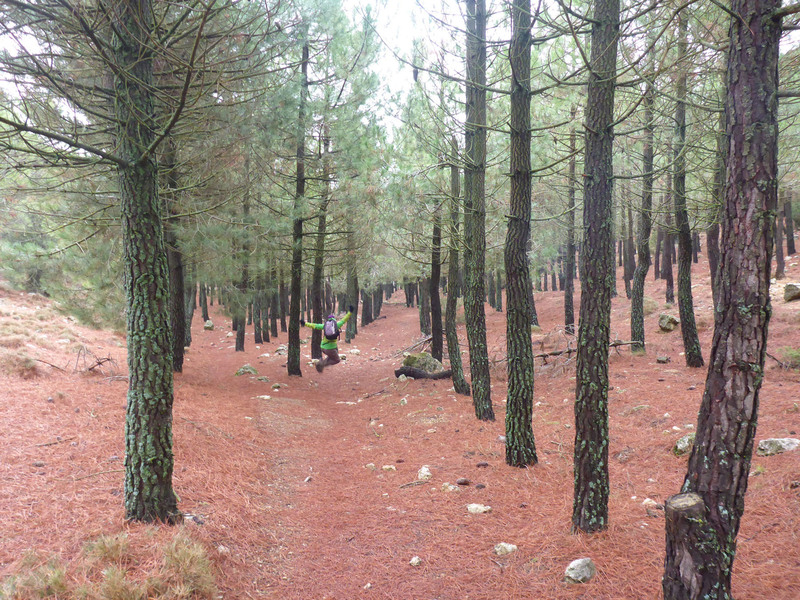 We passed through woodland areas with deep carpets of pine needles softening our path. We passed by stone built snow wells, used as rudimentary fridges for hundreds of years in pre-electric societies to preserve food, these examples dated from the 16th century. 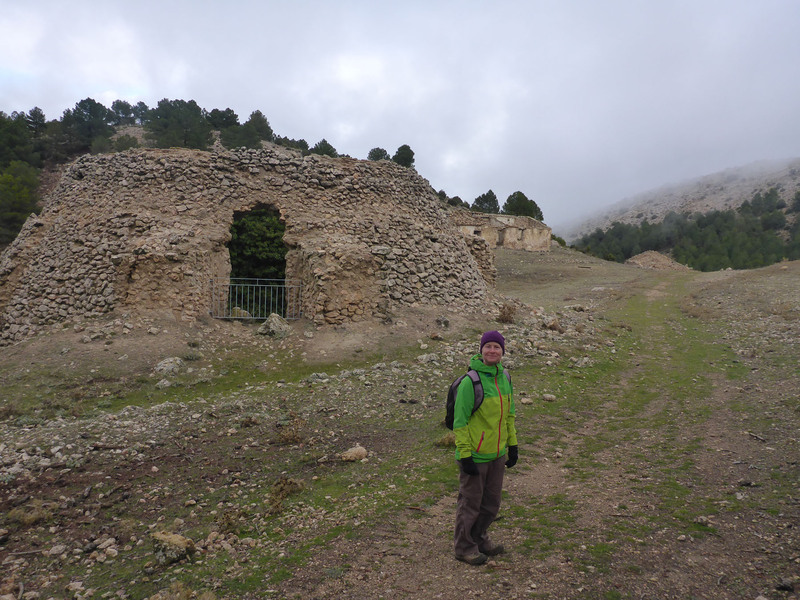 We saw the remains of six or seven beehive shaped structures, but there were 25 or so in the local park spread over several summit slopes, all set at around an altitude of 1400m. 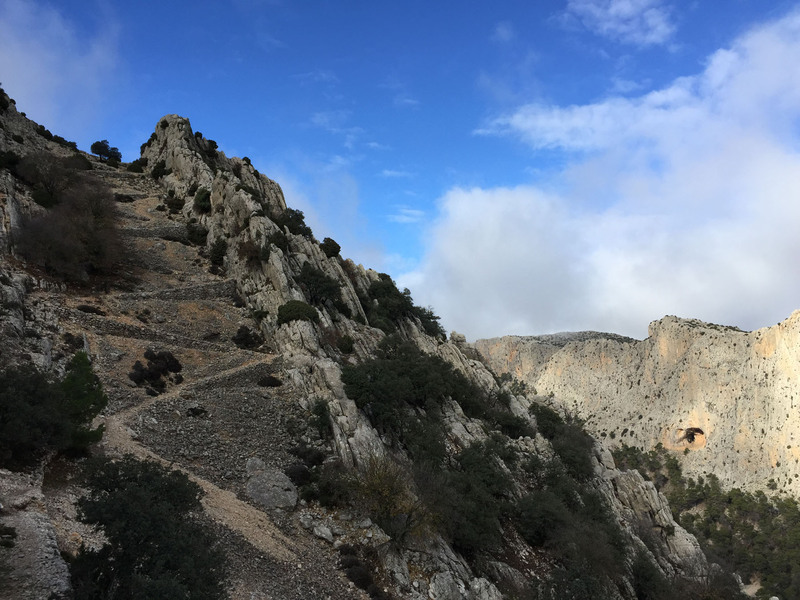 Some of these pozos de nieves have been restored, but we didn’t get the opportunity to visit one of these, seeing only the overgrown but impressive ruins. 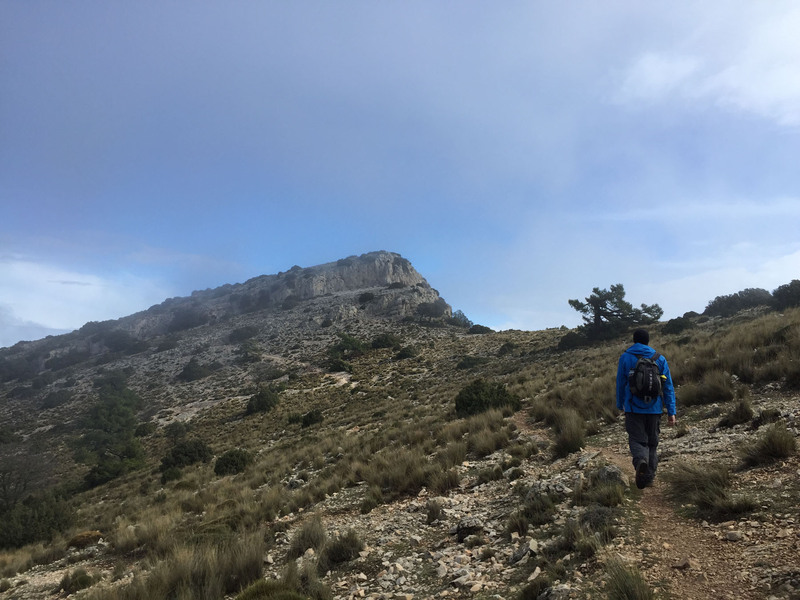 After completing the final kilometres of the route on easy gravel paths, we returned to Benny with two summits and 16km in tough mountains completed. We then drove to visit an interpretation centre set deep in the mountains, but managed to pick the only day of the week – Monday – that it is closed. This was a slightly disappointing end to a great day in the mountains, but we still felt very content with our day’s activity – only dinner and wine awaited. 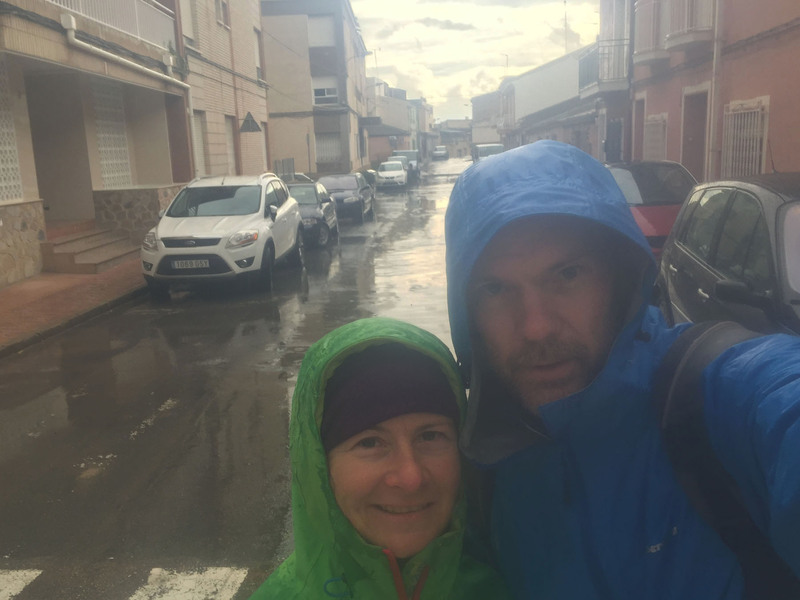 The weather was similar, in a good way, to the previous day, so we jumped at the possibility of completing a cycle in the local area. After a good day’s walking, we didn’t want to push ourselves too far, so opted to visit the fairly local town of Aledo. Although seemingly quite close at only 10km from our campsite, we didn’t fully appreciate the steep uphills and short but difficult hair pins we would encounter on the route. We started off feeling cold, but this didn’t last long with the steep ascents. We climbed steadily, the road punctuated with some very steep sections, through managed forests, townsteads and small villages. 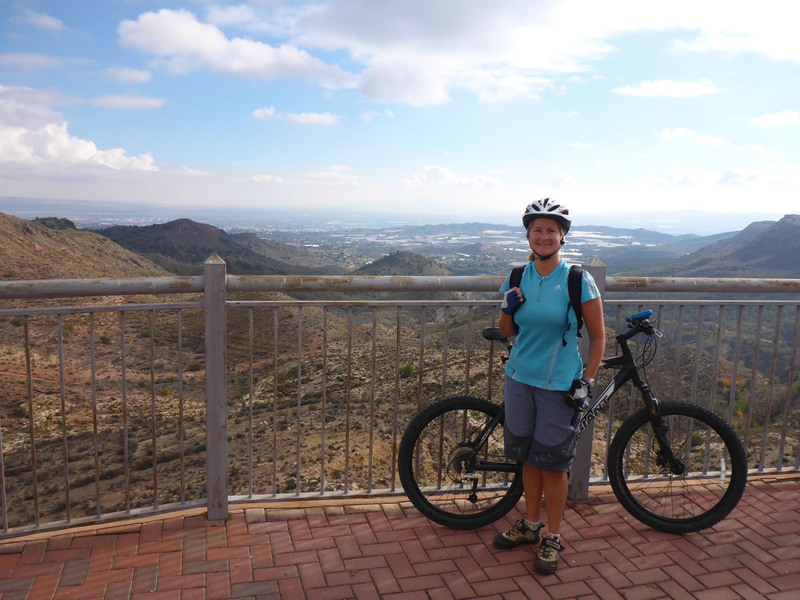 We crossed over the main road at the highest point of our cycle and enjoyed views over to Aledo from here, across the valley. We continued through and over to the end of the village, to a prominent plaza. A pretty church and tall stone tower were positioned here, demanding panoramic views out over the countryside beyond. 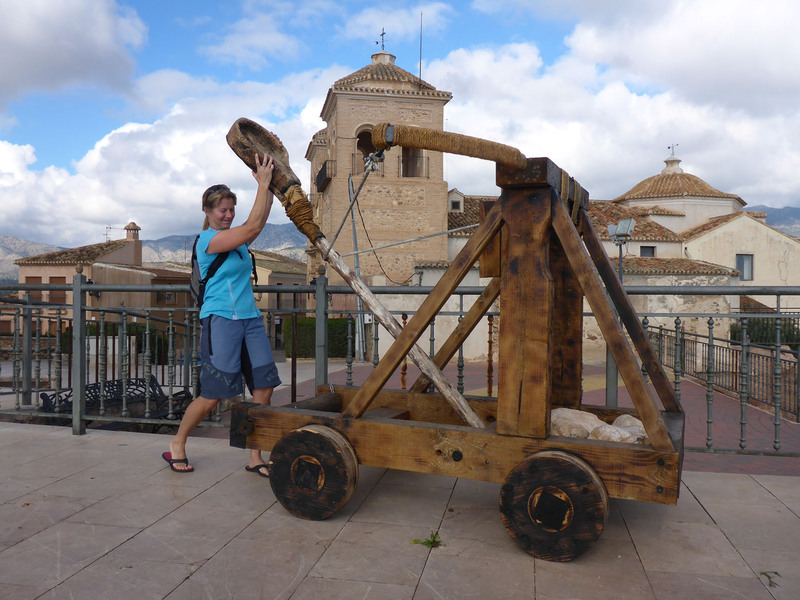 Near the entrance to the tower we found a miniature but still quite deadly looking trebuchet catapult that could launch human head sized boulders at enemies. After all the efforts to reach the town, our return journey took only a few short minutes of wonderful downhill rolling, and we were back in our campsite in time for lunch. 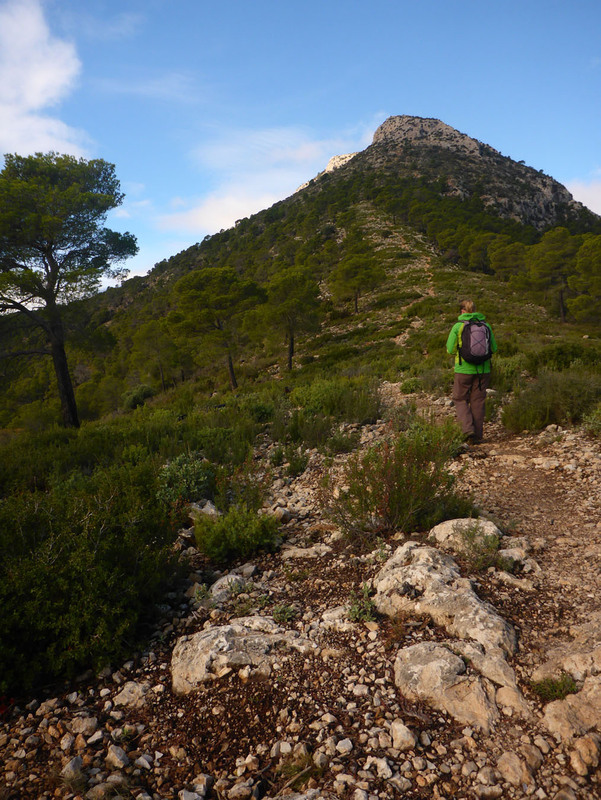 In the early afternoon we decided to walk back into Totana, as we heard it was market day. 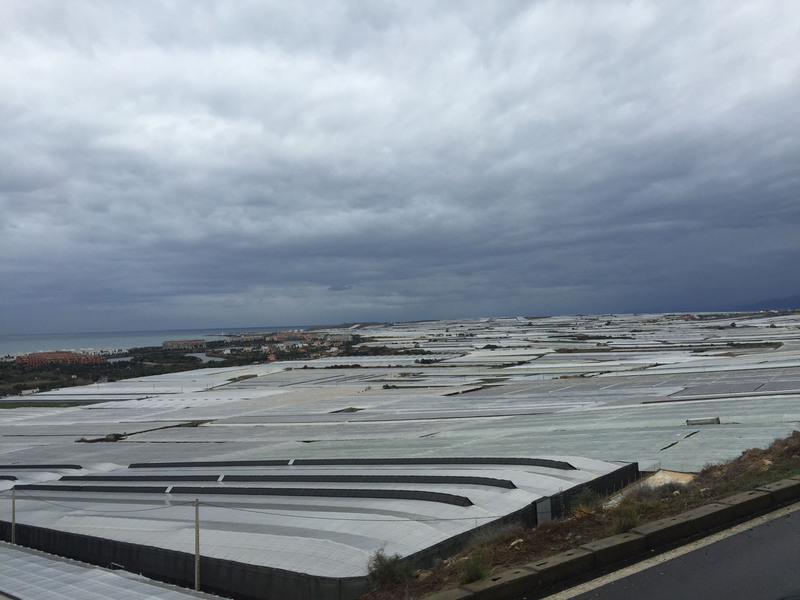 We hoped for some interesting local produce and fare, but found the market was dominated by the same gaudy clothes, socks, large pants and mobile phone covers that appear in every town market, so it held no appeal for us. We wandered a bit further than our previous visit when we got soaked, now seeing a few things in the town in a different light, either from familiarity or as a consequence of the improved weather. 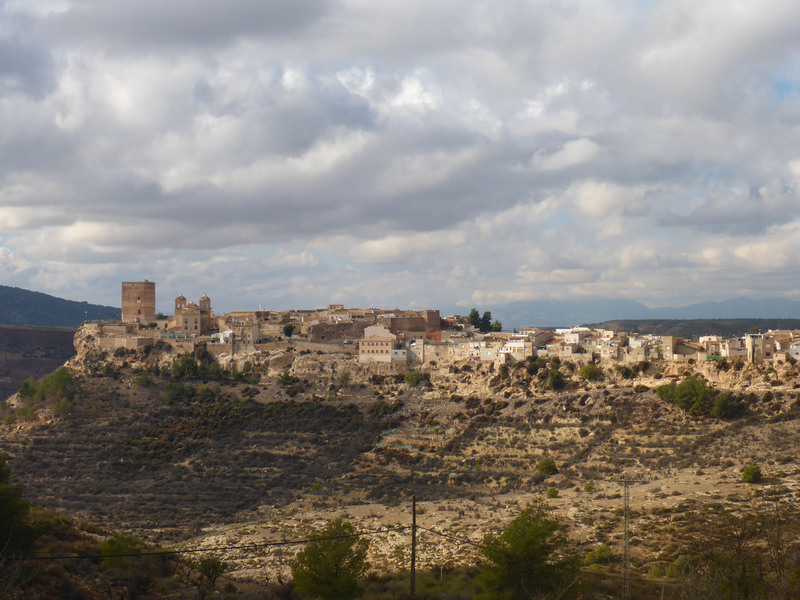 We never did grow to love the town of Totana; just its location in some fabulous mountain scenery. 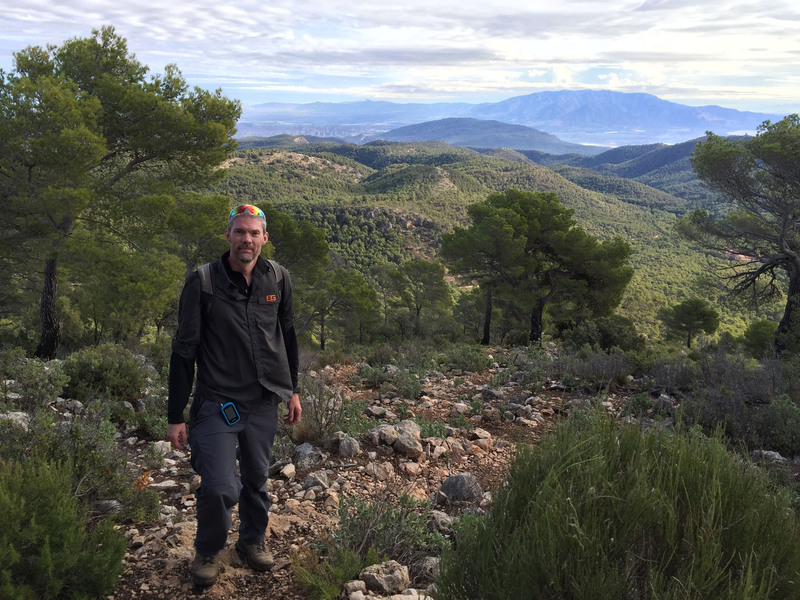 This entry was posted in Cycling, Hiking, In Spain, Our Travel Journal, Spain on Dec 15, 2016 by Aaron Hill.